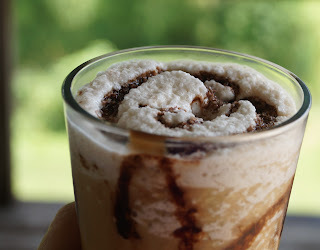 There is a local coffee shop that makes the most awesome frozen coffee drinks. If I lived in town I'd have one every day. I'd also be broke. I found an espresso machine at a second hand store for $5.38. I thought for that price I'd give it a whirl! I do still stop by the coffee shop for a drink now and then. She does a really good job! Blend all but the chocolate or caramel syrups and whipped cream. If using syrup drizzle on the inside of your glass. Pour in drink and either top with whipped cream or drizzle on more syrup. Feel free to use more or less of any of the ingredients (except the espresso) to change it up the way you like it. *It won't be quite the same but you can use a regular coffee pot with the same measures above and double up on your filter to make your "espresso." I drink iced coffee both winter and summer and I definitely enjoy a adding chocolate. Thanks for sharing this on Foodie Friends Friday this week. This is definitely on my list. :).